A black and white photograph of the front of Bell's Taxi after the fire. A Bell's Taxi is parked out front. 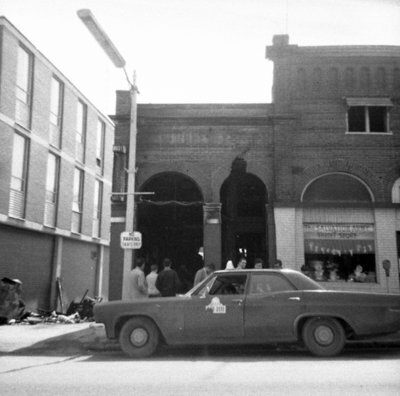 On April 7, 1969 a gas explosion caused a fire that destroyed Bell's Taxi located at 105 Dundas Street West. The adjacent building next door and the apartment above also received smoke and water damage. Fire at Bell's Taxi, April 7, 1969, Brian Winter. Whitby Archives A2013_004_307.